Under that sleek exterior, an improved blade and fan assisted airflow ensures a clean cut and collects every last clipping for a neat and tidy finish, every time. These are also our quietest lawnmowers. Combined with comfortable controls and weighing up to just 16kg they're a doddle to use, lift and store. The larger HRE370 also offers precise cut height adjustment with a single lever. 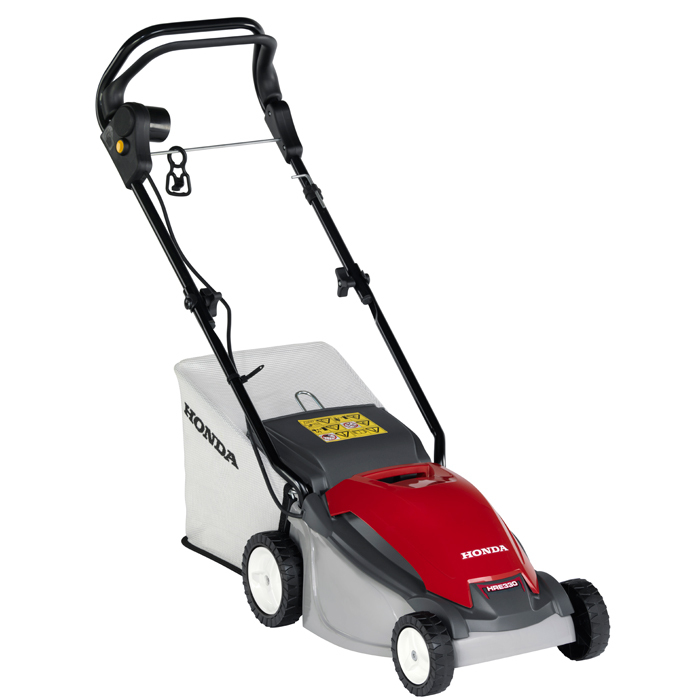 Getting a great lawn has never been easier. Made to handle - Strong handles fold into position ­ just spin and hand-tighten the bolt attachments at the side. When you want to put the mower away, just spin them loose and fold the handle down. Easy to lift - Built into the top cover is a well-positioned handle that makes it easy to carry and lift the whole unit over uneven ground ­ quickly, safely and easily. Made to bend - This may sound strange, but the blade on an HRE mower is designed to bend ­ and for good reason: If it hits something hard, it will not shatter or break, which prevents further damage to the unit and also increases the levels of safety. Made to last - The electric motor is housed in a tough cutter deck. Resistant to shocks, abrasion, fuel, UV rays and weather deterioration it will not only perform better but it will look better for longer too. Easy to empty - The high-airflow grass bag is very light; it’s been designed this way so as to allow maximum airflow with a fine mesh to collect any dust. It’s easy to detach and re-attach once you have emptied all the grass cuttings.